Wassup, fam! I hope y’all are in the mood for another batch of short-term chart patterns ‘coz I’m serving up a couple more on NZD/CHF and EUR/AUD. 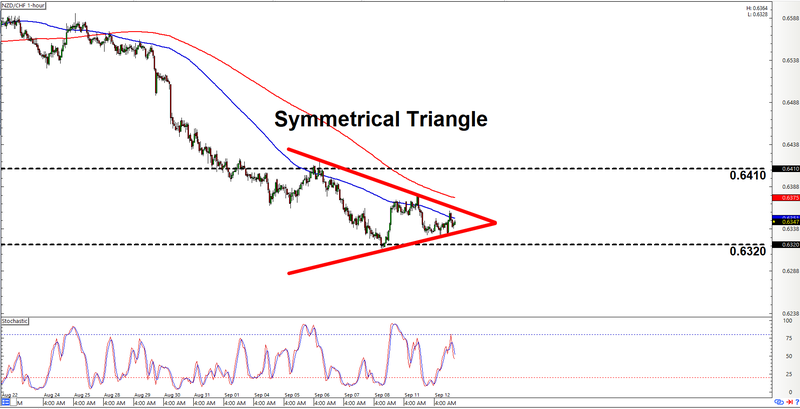 If you’re looking for a breakout play, then check out that there symmetrical triangle on NZD/CHF’s 1-hour chart. As y’all probably know by now (since I keep writing about it), we don’t really have a strong directional bias on the pair since a topside breakout from a symmetrical triangle is just as likely to happen as a downside breakout. However, if we look at our technical indicators, we can see that them moving averages are still in downtrend mode. Stochastic, meanwhile, is pointing back down after briefly testing the overbought area. They’re therefore leaning more towards a potential downside break. And if a downside breakout does happen, then the pair should ideally smash lower past 0.6320 on strong bearish momentum. But again, a topside breakout is also a potential scenario. And clearing the area of interest at 0.6410 would be a signal that a topside breakout scenario is playing out. EUR/AUD has been steadily trending ever higher for some time now. And if we connect the most recant peaks and troughs, we can see that the pair appears to be trapped inside that there ascending channel. 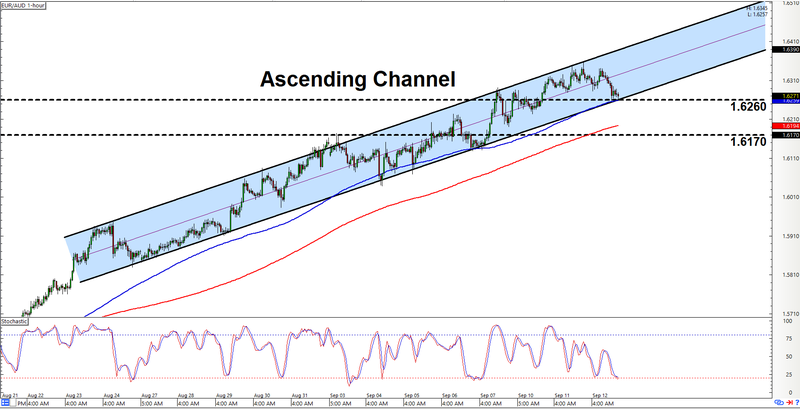 And presently, the pair is testing the channel’s support at 1.6260. Y’all may therefore wanna start lookin’ for a chance to go long on the pair. And all the more so, given that stochastic is already signaling oversold conditions, while the 100 SMA appears to be holding as dynamic support. But as usual, do keep in mind that there’s always a slim chance that the support may fail to hold, resulting in a downside channel breakout. And in the unlikely event that such a scenario plays out, then y’all may wanna think about switching to a more bearish bias if the pair moves lower past 1.6170.